The Amalfi Coast is one of the most beautiful areas of Italy. Situated between Sorrento and Salerno, it features a rugged coastline, beautiful views of the seaside and some interesting towns. 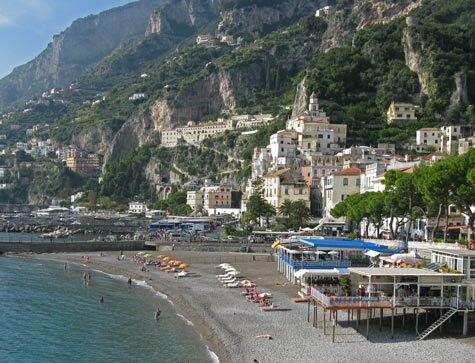 The town of Amalfi is located 31 km east of Sorrento and 32 km west of Salerno. It is home to a lovely church, a seaside pedestrian promenade and a pretty beach. Independent travellers can purchase a day pass on the local bus system, travel between Sorrento and Salerno making visits at Amalfi, Positano and other towns along the Amalfi Coast. Comprehensive visitor information is available on the Amalfi Coast Visitor's Guide.